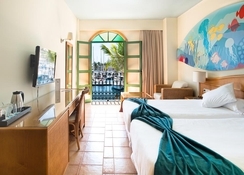 With modern facilities, Hotel The Puerto de Mogan Gran Canaria offers the perfect accommodation to spend a few days in the southwest of Gran Canaria, in Mogán. The hotel has a restaurant and two bars, as well as a swimming pool that offers direct access to the sea. The jewel of the hotel is the wellness center that offers a sauna, massages and a Jacuzzi. 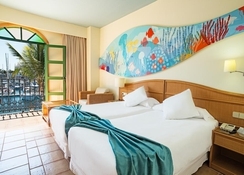 The rooms are bright and pleasant spaces, equipped with a safe, minibar, air conditioning, Wi-Fi connection and a private bathroom. The marina of Mogán is a few meters from the hotel and the nearest airport is less than 60km away. 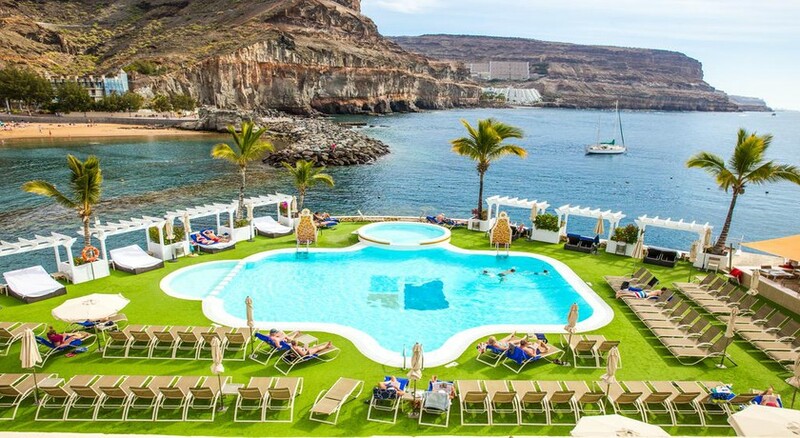 Located in a residential area next to the marina of Mogán, Hotel The Puerto de Mogan Gran Canaria is a perfect establishment to enjoy the wonders of the southwest of the island of Gran Canaria. Piedra beach is about 50 meters away and guests can also enjoy Mogán beach which is only a few hundred metres from the hotel. The beautiful beach of Maspalomas is half an hour away by car and Palmitos Park is about 40 minutes from the hotel This island has many different faces, each of them linked to a different landscape, something that shows the variety and richness of its territory and its natural heritage and the Puerto de Mogan is a prime location to explore the rest of the island. 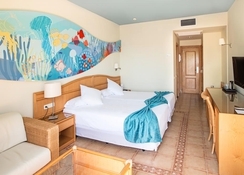 The 56 rooms of the Hotel The Puerto de Mogan Gran Canaria have a terrace or balcony and have tea or coffee making facilities, and are equipped with a safe, air conditioning, minibar and sofa. The bathroom is equipped with a bath or shower and has a hair dryer, makeup mirror and amenities. The apartments can accommodate up to three people and they have a sofa and a balcony or terrace. The kitchen has a microwave, ceramic hob and fridge and the equipment includes television, safe, air conditioning and Wi-Fi. 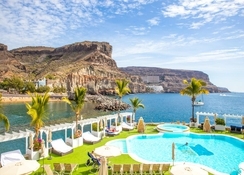 Hotel The Puerto de Mogan Gran Canaria offers a wide variety of local and international delicacies at Restaurant Club de Mar. Guests can also sample house wines, cocktails and spirits at the Pool-Bar Club de Mar and Pool-Bar Marina. The hotel's facilities include an outdoor pool where you can sunbathe on comfortable sun loungers. 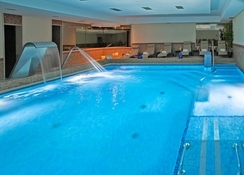 There is also a children's swimming area and the hotel offers two poolside bars. Guests can book services such as car rental and excursions from the reception desk. Alleviate your stress completely thanks to the massage service that is offered from the hotel and there are various spa treatments, sauna and a Jacuzzi too. We stayed in a standard apartment which was clean and spacious some distance from the main hotel which was not a problem for us. Our apartment balcony was small and facing the road but we managed to sit on it and watch the world go by. The pool available to apartment users was very busy even at the end of April we only went once didn't use the roof spa. We paid to spend a day by the pool at the hotel it was cloudy that day but lovely and peaceful and the pool is fabulous. We had a roof terrace with our apartment with table chairs and sun beds and my only criticism was that they did not provide an umbrella so I would recommend purchasing one if you are in a standard apartment for a week or more. The location and staff make this a fabulous place to stay. But if the road is still closed to Taurito then you might want to consider getting a taxi from the airport as the bus takes a very long time! Great self catering apartment with a quiet shared rooftop sun terrace along with free use of pool/bar opposite our unit.